What are alternatives to a tripod when I can't take one along? Due to weight restrictions I cannot take my tripod on my next foreign trip. What are the alternatives? Several people have mentioned beanbags and such which are nice, if you want to spend a few bucks on a dedicated solution based on the beanbag concept then check out The Pod series of "beanbags with camera mounts". I have been using one for a few years and they are great and don't take up much room. The Gorillapod range are quite portable tripods, with the added benefit of 'attach anywhere' - at least places you won't get a conventional tripod! You can use a monopod as a lighter, but still sturdy alternative. Small legs for the point at the bottom can serve to help steady you, although it's no replacement for a proper tripod. GorillaPods are an option, as mentioned by others. I actually like to use a beanbag when I'm tight for space; it turns almost any surface into a usable camera mount. You can fake the tripod with few metres of string. Instructions here. Perhaps not applicable in all scenarios, but taking sequences of photos as the maximum speed possible in your camera (say around 5 or so frames) can act as a "stabilizer". 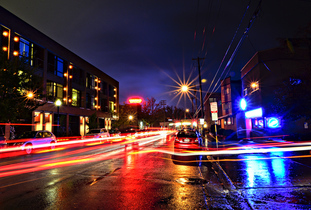 Out of such a series, one frame tends to be pretty sharp, even at rather slow shutter speeds. If you are so weight restricted that even a Gorillapod wouldn't make it, then look for the more stable support you can get reach of that would allow you to place your camera in the approximate position you want to shoot from. When indoors, tables, chairs and walls are good candidates. When outdoors, look for posts, branches, rocks or other natural platforms. If your camera allows, lock the exposure (and eventually the focus) before placing the camera on its chosen place. Remember to check if the camera is out of slipping danger. Also, if your camera has the options for that, turn off image stabilization, turn on the self timer (2 seconds are enough for shots you don't plan to be part of, 10 seconds otherwise), and press the shutter. Consider investing in lenses with image stabilisation, or a camera body with stabilisation depending on the brand and type of camera that you use. Even on wide angle lenses I've had good use of my stabilized lenses in places where I could not take a tripod not only because of transport restrictions, but also because of local restrictions on site. You can bring a small gorilla pod, or my preference, a little collapsible monopod. monopods are great because they offer a lot of monitored support, but are quite compact and lightweight. My mom even bungees hers to available supports and uses the timer mode to take "afk" pictures. If you're going to be hiking, many walking / hiking sticks have a camera compatible screw mount under the handle. A beanbag doesn't take too much space in your bag. Scott Bourne has recommended using a bean bag as an alternative, and for traveling he takes a bag/sock then fills it with beans/rice/etc. when he gets there. I bought a Trekpod this spring, and I like it a lot. I took it on a 10-day canoe trip to Canada, and I really appreciated a piece of equipment that did double duty. If you haven't seen one, it's a walking stick of sorts with tripod legs that fold out at the bottom. It's not quite as stable as a full-sized tripod, so it's more susceptible to swaying in the wind, and it's not as good on uneven ground as a full-featured tripod, but it folds into a very functional walking stick when you're not using it as a tripod. Most of the landscapes in this gallery were taken on the Trekpod, and I'm certain that most of them wouldn't have turned out due to the long exposures I needed (see some of the sunset pics). Just to round out the entries here -- if weight is a concern (and not "nopod" zones), then you'd have to be pretty tight on the limits not to have room for the Zipshot. It's not something I'd use as an everyday tripod, but if you think of it as a stabilizer (you'll need to be hands-on in order to avoid mirror and shutter vibrations) it'll get you a couple of stops you wouldn't have otherwise. As far as I can tell, the idea came from those collapsible feeler canes for the blind -- it's essentially three of them attached to a mini ball head. It's a bit spindly, no question about it, and you wouldn't want to use it with a heavy lens, but it feels at least as good as the Cullman Magic 1 I used years ago, and at 11oz (312g) and 15" folded it's certainly portable enough. I've used a combination of gorilla pod + walking stick with some success (my walking sticks are not equipped with a screw mount) It's a more flexible setup than just the gorilla pod, or just a monopod. A new product, HandlePod, may work for your purpose. It is small, light (4 oz.) and can be use where tripods are not allowed. It is a handle topped by a 3-axis rotating camera mount and backed by four rubber feet. Hold it against any available solid object for tripod-like stability. Check it out at www.handlepod.com. 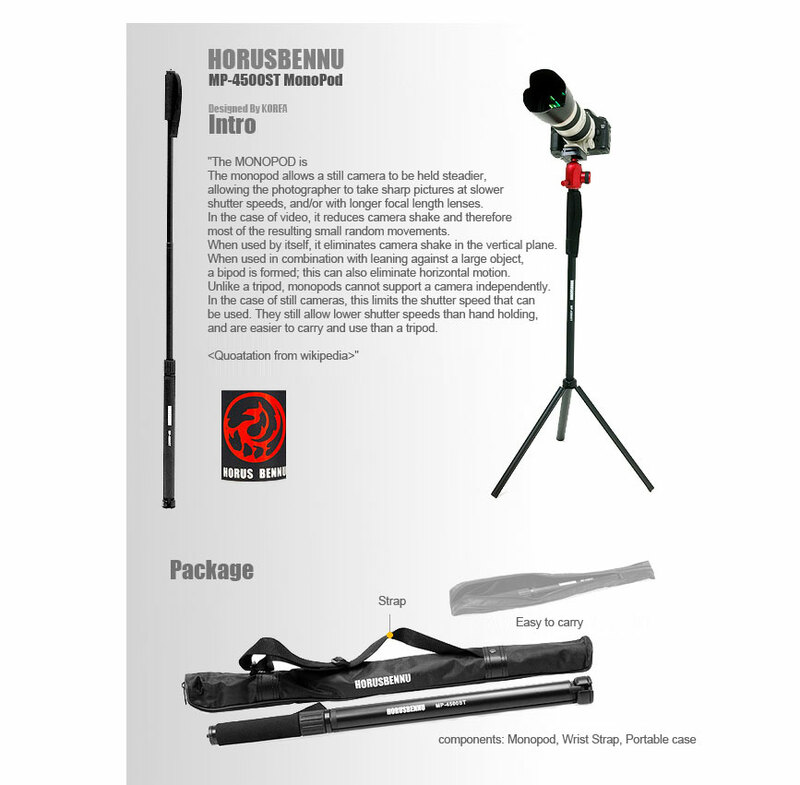 I recently bought a Horusbennu monopod. It weighs 0.9 lbs, and is able to hold my D7000 + 30mm without any issues. I've used two things. One is Promaster SystemPRO clamper that comes in different sizes, can be used like a mini pod and clamps onto lots of things. And it can be used for strobes. Not the answer you're looking for? Browse other questions tagged equipment-recommendation tripod travel weight support-equipment or ask your own question. How do I reduce the noise in this image / prevent noise in future images? What are the advantages and disadvantages of different solutions for camera stabilization when tripods and monopods aren't allowed? How do I judge tripod sturdiness when buying online? Why are tripod legs and heads sold separately? Why no 1-piece tripods? Choosing Tripod Based on Load Capacity?